So often in our baseball debates we’re searching for the best something: The best hitter of the 80s, the best pitcher of the pre-WWII era, etc. Yet rare is the occasion where we search out the worst player in a particular category or era. Sometimes that player jumps out at us and makes us notice; it’s the only reason that anyone knows Neifi Perez’s name. But unless it is blatantly obvious the worst player often goes ignored. Until I ran a random Play Index search last week, I had never heard the name Bill Bergen, the man you see to your right. Now that I’ve found him, though, I’m confident that he is the worst hitter in baseball history. When citing an example of sporting dominance, I often turn to Wayne Gretzky. He is the only player in NHL history to score 200-plus points in a season, and he did it four times. Bergen provides a similar example, except we can replace the word dominance with ineptitude. He is the only player since 1901 who accumulated 250 or more PA with an OPS+ of 10 or less — and he did it in three consecutive seasons. Bergen’s Wikipedia page provides a fitting account of Bill’s shortcomings at the plate. Bergen had 3,228 at-bats in his career, and in that time he compiled a batting average of .170, the all-time record low for players who compiled more than 2,500 plate appearances. Three pitchers with more than 2,500 plate appearances managed higher career batting averages than Bergen: Pud Galvin with .201, Bobby Mathews with .203, and Cy Youngwith .210. Among position players, the next lowest career batting average is Billy Sullivan with .213. Bergen’s career on-base percentage was .194—he is the only player with at least 500 at-bats with an OBP under .200. He had only two home runs. In 1909, Bergen hit .139, the lowest average ever for a player who qualified for the batting title. That season, he set another record for futility by going 46 at-bats in a row without a base hit, the longest streak ever by a position player (pitcher Bob Buhl went 88 at-bats without a hit). 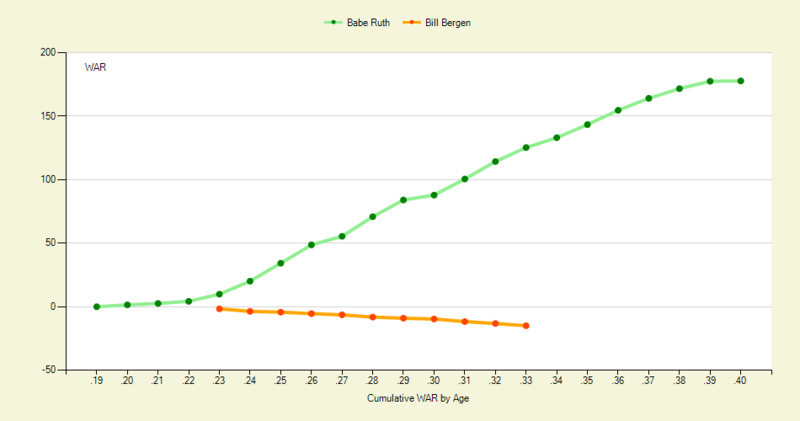 From 1904 to 1911, Dodger pitchers as a group outhit Bergen, .169 to .162. If you go to our career leader boards and sort by poorest wOBA, you’ll see that 23 players in baseball history have a worse career wOBA than Bergen. How, then, can he be the worst hitter? Click on any one of those 23 names. And then click on another. And another. Notice a trend? They’re all pitchers. In fact, on that page of the 35 worst wOBAs in baseball history, only one other player, Stump Weidman, is a non-pitcher. The WAR leader board tells a similar story. At -15 WAR, Bergen is the worst position player in history, as the two players ahead of him are, yes, pitchers. (Greg Maddux?!?) And, again, most of the surrounding players on this first page of WAR trailers are pitchers. Taking it a step further, if we sort by batting component, we see that Bergen ranks second worst, by 10 runs, to Tommy Corcoran. But that’s just a matter of time. In his 18-year career, Corcoran came to the plate 9,368 times and produced nine seasons with a .300 or better wOBA. In Bergen’s 11-year career he came to bat only 3,228 times, and had only four seasons with a wOBA over .200. Of course, no player hits that poorly and sticks around for that long without having a redeeming quality. 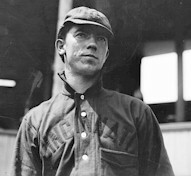 Bergen was widely considered the premier defensive catcher of his time. He owns the record for most runners caught stealing in a single game, six. He also sits on many baseball historians’ lists of best defensive catchers. Still, even if we disproportionately weigh his mythical defensive abilities, it hardly compensates for his historically putrid skills with the bat. Bill Bergen has his place in history, though it might not be a favorable one. Yet he’s not the most famous, or infamous, baseball-playing member of his family. As William of The Captain’s Blog eloquently chronicles, Bill’s brother Marty, himself a catcher in the late 19th century, took an axe to his wife and children before slicing his own neck. It’s tough to come up with a fitting conclusion to a story involving the worst hitter in baseball history. Instead, I’ll leave you with a graph I couldn’t resist creating. We hoped you liked reading The Worst Hitter in Baseball History by Joe Pawlikowski! And yet Neifi is a veritable slugger compared to the excruciating awfulness that is Juan Castro (career wOBA .260, -4.4 WAR). Only 2800 something PA, but honestly, how exactly does this guy have a 16 year major league career? Who keeps thinking he deserves another shot at the majors? The Dodgers kept bringing Bill Bergen back because of his defense. 100 years later, they keep bringing Juan Castro back because of his….defense.